Black pepper has lots of health benefits. It is also good for helping you lose weight. It is low in calorie and packed with minerals, vitamins, healthy fats and dietary fibre. According to research made, black pepper contains piperine, which has the ability to prevent fat cell differentiation, improve fat metabolism and increase the bioavailability of nutrients. So, include black pepper in your daily diet and reduce weight as well as avoid diseases related to obesity. You can have black pepper internally or apply externally to lose weight. You get 100% pure black pepper oil from the pharmacy. Add one drop of this oil to a glass of water and consume it in the morning before you have breakfast. Applying this oil on the skin helps in treating skin infections. Black pepper tea is good for losing weight. It is also easy to prepare. You may add ginger, lemon, tulsi, green tea bags or cinnamon to prepare black pepper tea. Add ½ to 1 teaspoon of freshly ground black pepper to the tea and drink it before you have your breakfast. 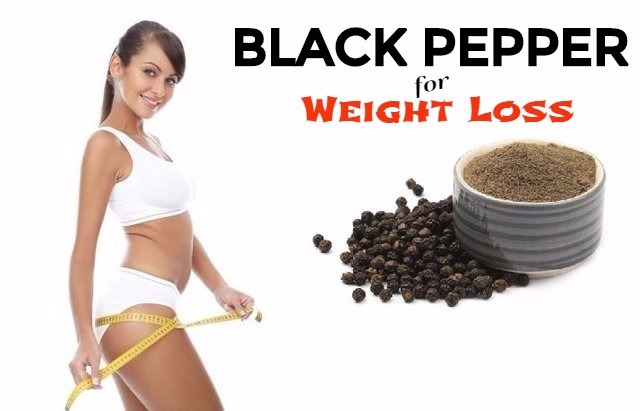 Black pepper drink is very effective for losing weight. All you need to do is to add black pepper into your vegetable or fruit juice. The pungent and distinct taste of black pepper can make your drink spicy. By consuming this drink regularly, you will not only lose weight, but also improve problems of the skin and the gut. You can even consume black pepper directly. Just chew 2 to 3 black peppercorns every morning. Do this only if you can tolerate the heat of black pepper. Consume 1 to 2 teaspoon of black pepper every day to reduce weight. If you are not used to consuming black pepper, you can increase the dosage gradually. Consuming too much of black pepper can cause gastrointestinal problems, burning sensation in the eyes, stomach irritation and respiratory problems. When to Consume Black Pepper for Weight Loss? Consume black pepper or black pepper oil before you have your breakfast. If you prefer to chew black pepper, you can chew it in the morning after you have your detox drink, but before your breakfast. You may also add it to your vegetable or fruit juice and have it. Boil the water and add honey and pepper to it. Stir it well and cool it to room temperature. Add the kale pieces into a blender and blend. Pour it into a glass and add lemon juice and black pepper to it. Crush the ginger root with a mortar and pestle. Boil one cup of water and add crushed ginger to it. Boil for 5 minutes and then strain it. Place the tea bag in it and soak for 2 to 3 minutes. Add black pepper and stir well, and then drink it. Add watermelon and pineapple into a blender and blend well. Now pour the juice into a glass and add lemon juice, freshly ground pepper and a pinch of salt. Mix pepper, olive oil, avocado, lime juice and salt in a bowl. Now take the boiled chicken breast and dice or shred it. Add the finely chopped bell peppers, salt and pepper to it. Now mix the diced chicken with the avocado dressing. Take a salad bowl and place the lettuce leaves in it. Next you have to place the diced or shred chicken over it. Top it with olive oil, black pepper and cilantro. Remember to drink at least half a cup of water after you have consumed black pepper. It is also important to include half cup of fat-free yogurt in your daily diet. This helps in soothing the intestinal walls. To lose weight fast, you should also watch the meal portion you have and do some light stretching exercises regularly.